What was your first team? When you first started playing what was your first team? What was your first team that you remember creating at the start? Jeez, it’s been almost a year. All I remember about who was in my lineup for sure is Mash, idol Liz, Carmilla. The rest of the slots were honestly just filled with whoever was the most impressive for the class I had at the time before I started whaling. As for CEs … the most random junk I could roll from Friend Points that had the coolest icons. I didn’t care about whether the effects were compatible with the Servant. I was an idiot when I first started and never put anyone in the back 3 spots, managed to get through Okeanos with no trouble. For me it was jeanne, Martha and vlad III from nearly the very beginning. Was a while before I started pulling… My next 5 star was waver, heh… I ignored mashu for a while… Glad I’m not now as I’m finishing camelot singularity, just the 2nd fight with the lion king now. I need to draw more phoenix pinions before I can finish leveling up her skills completely. I don’t have a pic sadly, but my first party was Herc, Ushi and Mash. 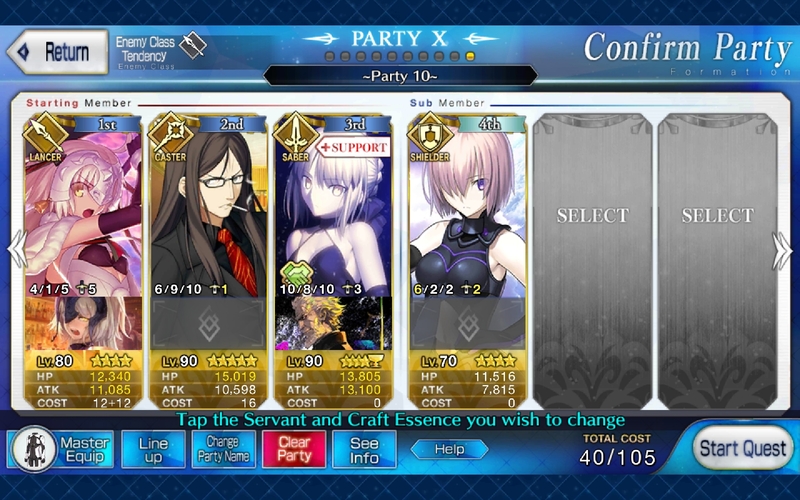 I just had Mash and a support Lv 100 Jalter for a long time. 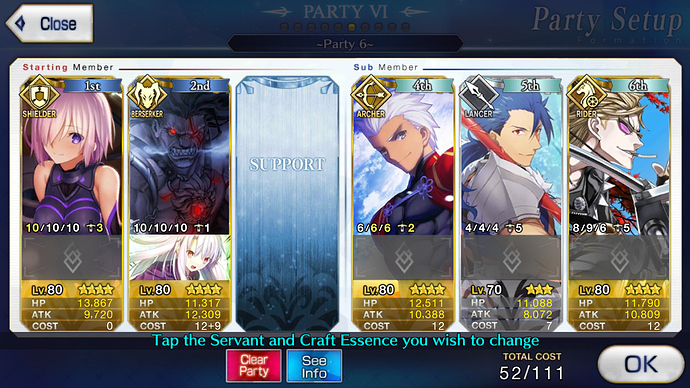 Then, when I got Sumanai I put him in my team. 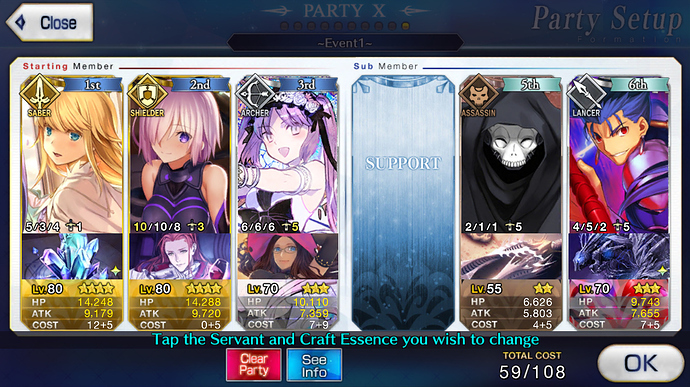 I didn’t know how to level up my servants, so both Mash and Sumanai were lv1 for a couple of weeks while MakaMaka’s (I still have this guy on my friends list) support Jalter singlehandedly carried me all the way to Okeanos where she was defeated by Drake. 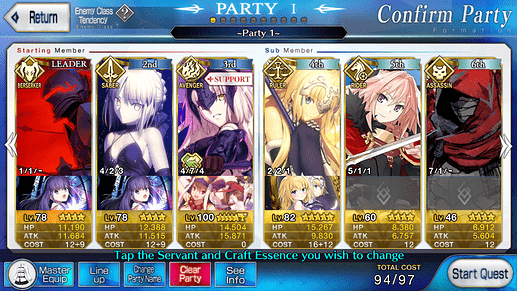 The I figured out that I could have more than three servants and how to level them up in the Illya event (I also got best girl Seibah in the gacha). And this was the first complete team I remember having. It’s almost a year, but it’s more or less similar to the image below. I started the account with Herc and Illya CE, so at the time, I just use Herc everywhere. Not long afterwards we were given a free 4* and I pick Emiya for that. Of course Kintori came straight after that and that’s when I really have a team. 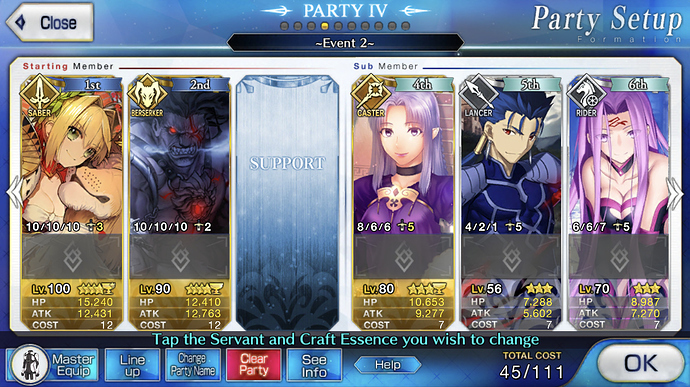 Had the dumb luck of getting herc and emiya for my starter roll. They made up the bulk of my team for like the first 2 singularities. I was contemplating if I would continue playing the game after a whole month so I used up all my quartz on the story banner. I didn’t know it was dumb to roll there but it got me mordred as my first ssr. More than 300 days in, no regrets. 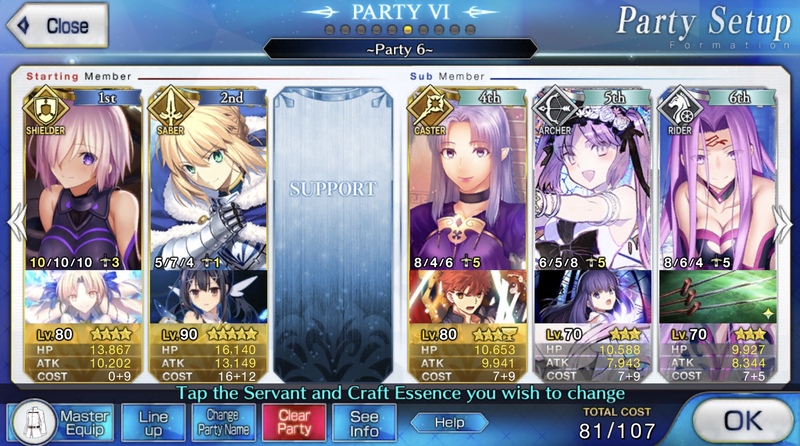 This is the exact team I carried into my first battle (account was a gift). I had no idea how the game worked then. I mean technically, my first team was Sabertoria, Arash, and Cu. The tutorial team. 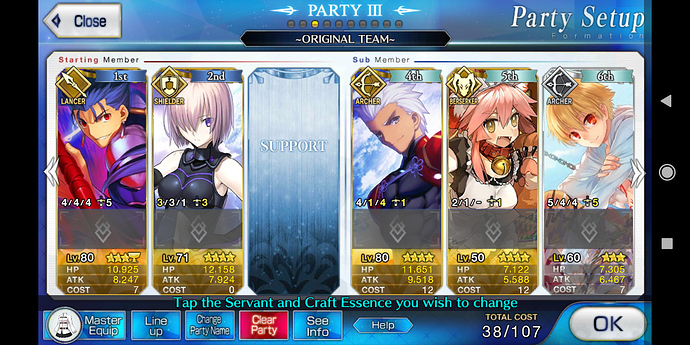 Otherwise, first team was Mash and Tamamo cat. Probably Siegfreid, Mash, David, Euryale. In my case mash,carmilla, Cesar and support Gilgamesh is the one who Carrie me and latter caster liz and santa alter join my party and after a while jack come home and become my primary attacker. I can’t say I ever really had a first “team”. In fact, even now having gone all the way through Shinjuku, I can’t say I have any set teams. For the most part, I use a support caster, usually a friend main DPS, and my own DPS. 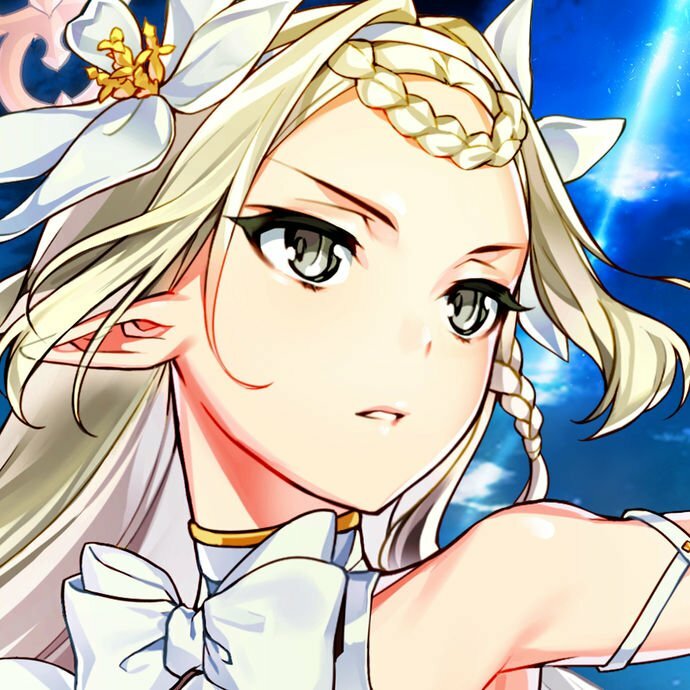 I choose mainly on the basis of class advantage, and in most fights, even daily farming, don’t try to 3-turn it. This was my first team. 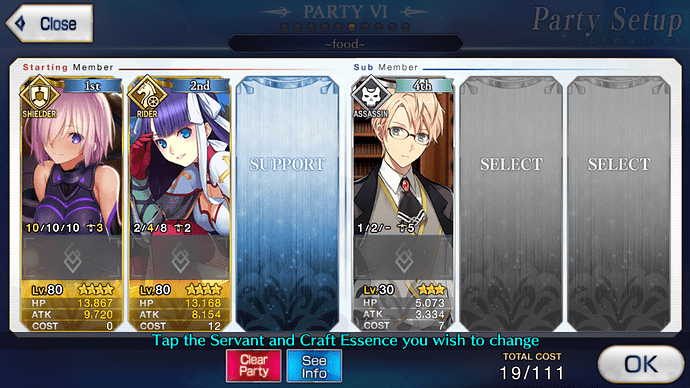 A lot has changed since I focused on certain servants.